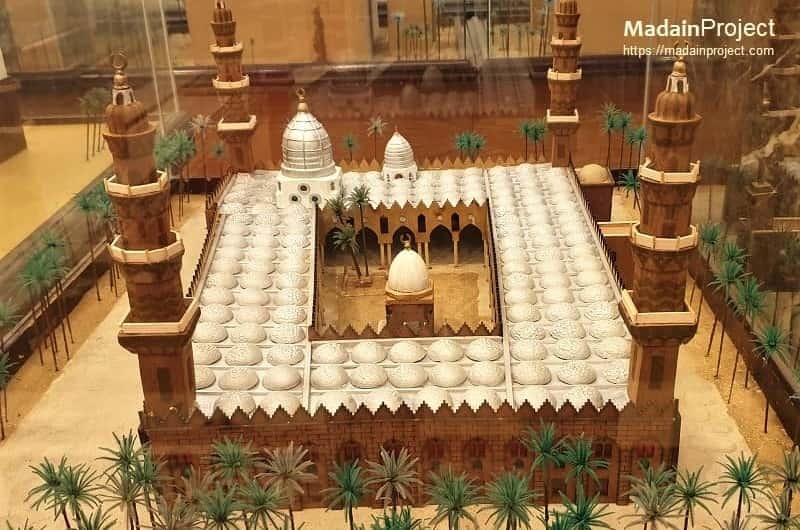 A model of the original mosque, at Dar al Medina, built by prophet Muhammad after he arrived in Medina following Hejrah from Mecca. The original mosque was 35 meters long and 30 meters wide. The imagined layout of the mosque as it might have looked in the first year of Hijrah, back then it was oriented north-south. The qiblah wall was to the north towards al-Aqsa and the al-Suffah was along the south wall. First expansion of Masjid al-Nabawi took place right after the Battle of Khaybar, Width was increased by 20 meters and the length by 15 meters. The new dimensions became 50×50 meters. The northern boundary of the Mosque was where the Turkish construction ends in this direction. On the west side its boundary was five columns west of the pulpit. You will see written on each column there ‘The boundary of Prophet’s Mosque.’ The foundation was laid with stones and the walls were built of unbaked mud bricks like before. The columns were made of palm tree and the roof was covered by branches of palm trees. The height of the roof was increased from 2½ meters to 3½ meters. Caliph Osman paid for the land for this addition of the mosque. In 29 Hj. Usman ibn Affan further extended the mosque by about 5 meters to south, by about 5 meters to north and by about 5 meters westwards. Hence the mosque was extended upto eight columns westward from the pulpit. It is interesting to note that the southern wall of the mosque is still at the same place today and no extension was ever made in this direction since the time of Caliph Osman. The building was constructed with decorative stones and lime mortar was used as construction material. The roof was made of teak wood. The columns were also made of decorative stones and were hollow inside. Iron bars and molten lead was put inside the columns to reinforce them. Caliph Osman supervised the construction activities personally. He made a protective enclosure around the area where he led the salat to avoid attack on him during the salat. This enclosure had windows and people could see the Imam through these windows. At present the Imam leads the salat from the same spot where Usman ibn Affan did. There is no protective enclosure nowadays. However, the security personnel are posted there before, during and after the salat to avoid any mishap. In 88 Hj. Waleed bin Abdul Malik ordered the Governor of Madina, Omar bin Abdul Aziz to extend the mosque further. Omar bin Abdul Aziz extended it about ten meters to the west and about fifteen meters to the east. It is necessary to mention here that by this time all the wives of the Prophet had passed away. Omar bin Abdul Aziz purchased their Hujrats (huts) from their relatives and included this area in the mosque. Aisha’s hujra was left as it was because of the graves in it. The building and the columns were reinforced with iron bars and molten lead. The roof was made of teakwood and was raised to a height of 12.5 meters. This lower roof was covered by another roof to protect against severe weather. Marble slabs were fixed on the inner side of walls. These walls also had multicolored stones and gold polish put on them at different spots. Gold polish was also put on the frames of the doors. Omar bin Abdul Aziz personally supervised the construction. He was the one who built four minarets on the four corners of the mosque and the new mosque had twenty doors. These construction activities took three years from 88 Hj. through 91 Hj. This extension took place from 161 Hj. through 165 Hj. and the mosque was extended in the northerly direction. The construction was supervised by Abdullah bin Asim bin Omar bin Abdul Aziz. No further extension was needed till 654 Hj. During the ‘Abbasid period, the ruler al-Mahdi (775–785ce) also enlarged al-Masjid al-Nabawi by extending it further to the north, adding 20 additional doors. Eight doors were added to the east and west walls while four were added to the north wall. During the rule of the Mamluk Sultans, al-Mansur Qalawun built a dome over the tomb of the Prophet (pbuh) in 1279ce. This was the first time that a dome was erected. It was made of wood and was colorless. Later it was painted white and blue. In fact for a while, the dark blue color predominated, a favorite of the Arabs. Al-Mansur also built an ablution fountain outside of Bab al-Salam (Door of Peace). Another Mamluk Sultan, al-Nasir Muhammad, rebuilt the fourth minaret that had been destroyed earlier. Sultan ‘Abd al-Majid (1839–1861) remodeled the entire masjid, enlarging it extensively. He did not, however, touch the tomb of the Prophet (pbuh), the three mihrabs, the minbar and the Suleiymaniyyah minaret. The prayer hall to the south was doubled in width and covered with small equal sized domes. The only exceptions were the domes that cover the mihrab area, Bab al-Salam and the tomb of the noble Messenger (pbuh). Sultan ‘Abd al-Majid was so careful in the work he undertook that he had an entire generation of huffaz prepared from a very young age and trained by the best of craftsmen in the Islamic realm. An aerial view of the mosque of first Saudi expansion. Shah Abdulaziz al-Saud issued commission for the first Saudi expansion of Masjid al-Nabawi, and in 1370 Hj. his son Shah Saud bin Abdulaziz laid the foundation stone. The whole project took about five years to complete and doubled the area of the earlier Ottoman mosque. By this time the pilgrims number continued to rise rapidly, as the number of pilgrims in year 1973 was about one hundred thousand, and in next 17 years it went up to one million. This expansion brought the total number of gates of Masjid al-Nabawi to 41 previous which was 11. Shah Faisal commissioned the installation of shades, these semi-temporary shades were installed west of the mosque.